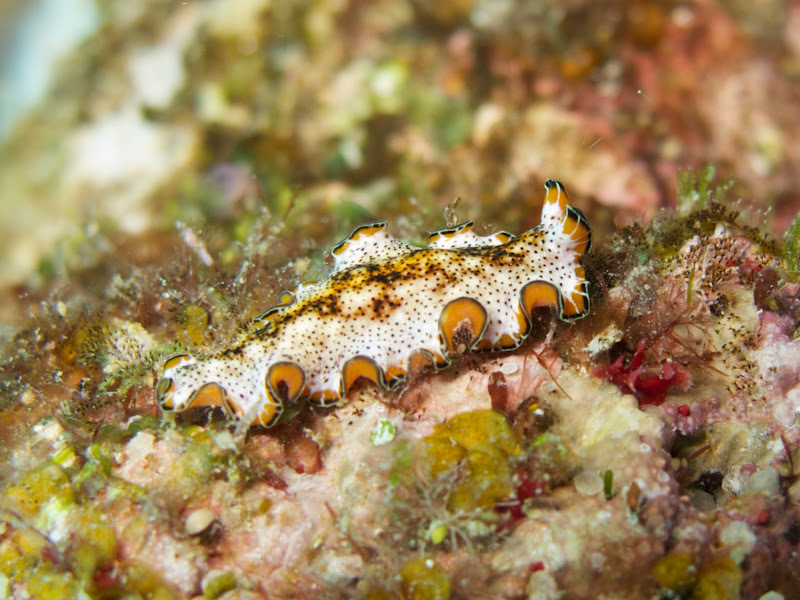 Today was all about nudibranch hunting with some great dive buddies. I managed to spot a few new types and also witnessed Randy Birt making his 100th nudibranch identification. It was a pretty cool moment and I had a great time! My day started by meeting up with Jessie and Jason at Maeda Point. We quickly donned our gear and headed down to the water. Because of the tide changes it was a tiny bit sporty but once we were underwater it calmed right down. 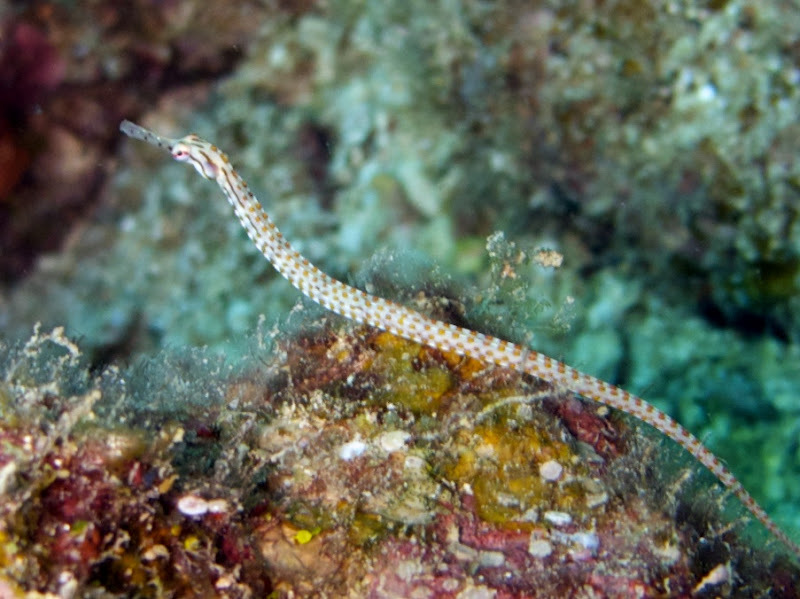 As we kicked to the north I noticed a small orange-spotted pipefish moving amongst the rocks. 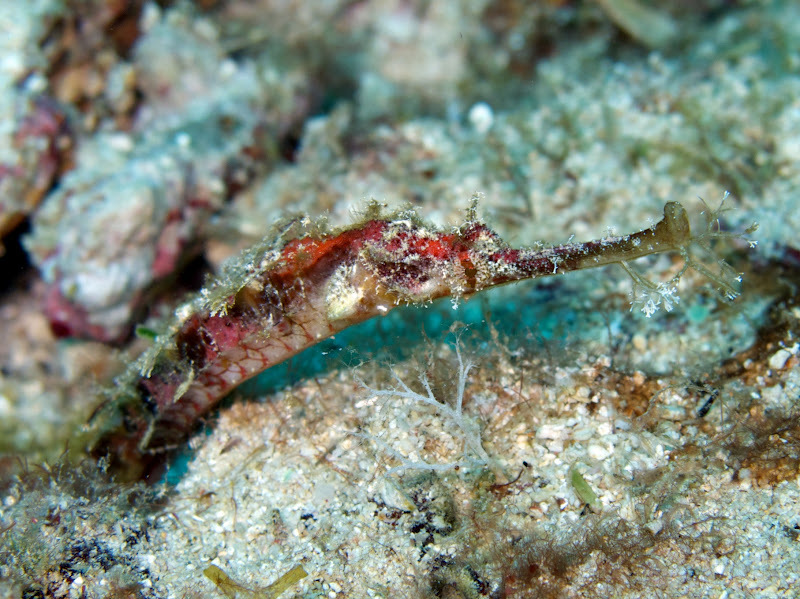 As I tried to take pictures of it, the pipefish worked its way through a maze of small creivces and rocks. In doing so, it made it nearly impossible for me to get any good shots. 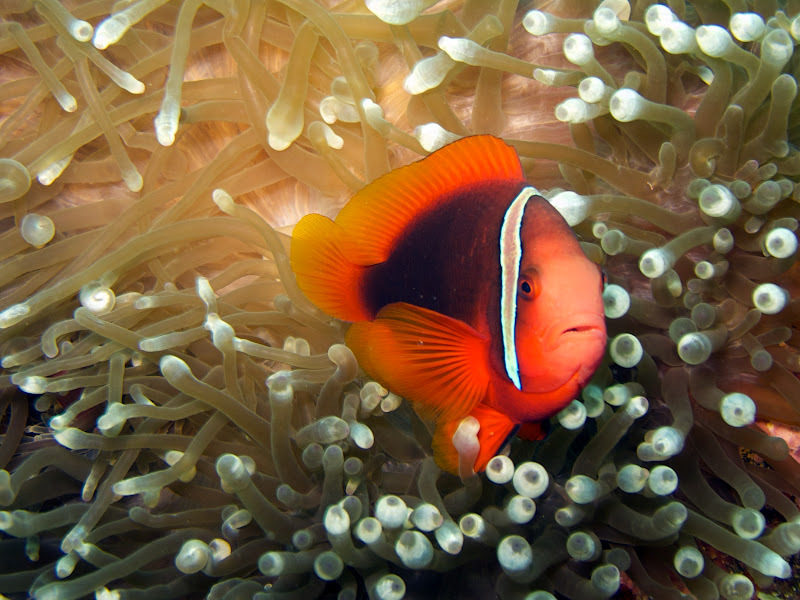 When we came upon a tomato anemonefish I actually managed to get a nice picture of it. Most of the time it seems like they will dart away just as I’m hitting the shutter button. Staying at a depth of around 45-50 feet, I managed to stop a Pseudoceros leptostichus flatworm. I’ve seen this type perhaps 3 times previously so I wasn’t very excited about. However, this is actually one of the first times my photos have turned out pretty good. 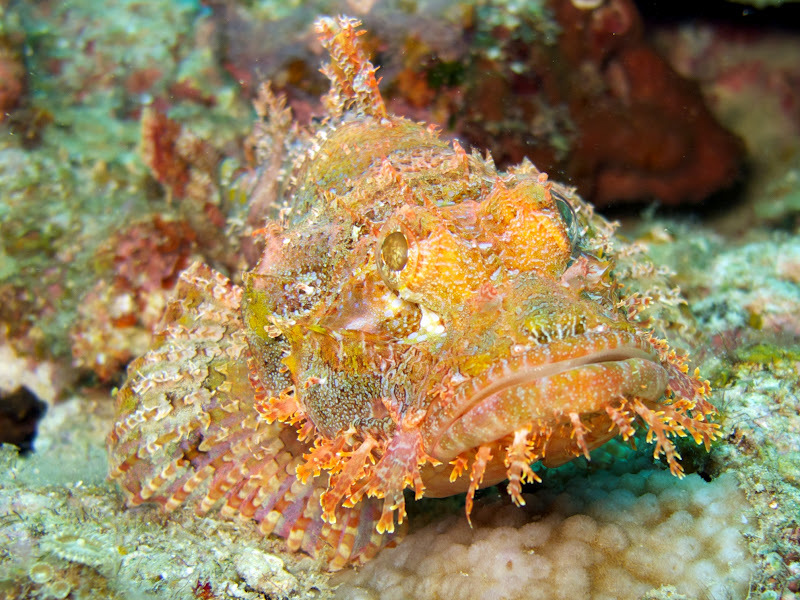 Tasseled scorpionfish are always great finds, and during this dive we found a ton of them! At one point Jason pointed downward to show me something so I looked to where he was pointing and didn’t see anything. I swam down closer thinking it must have been something small. Nope! Still didn’t see anything. I looked back up to Jason and shrugged my shoulders to show him I didn’t know what he was trying to show me. 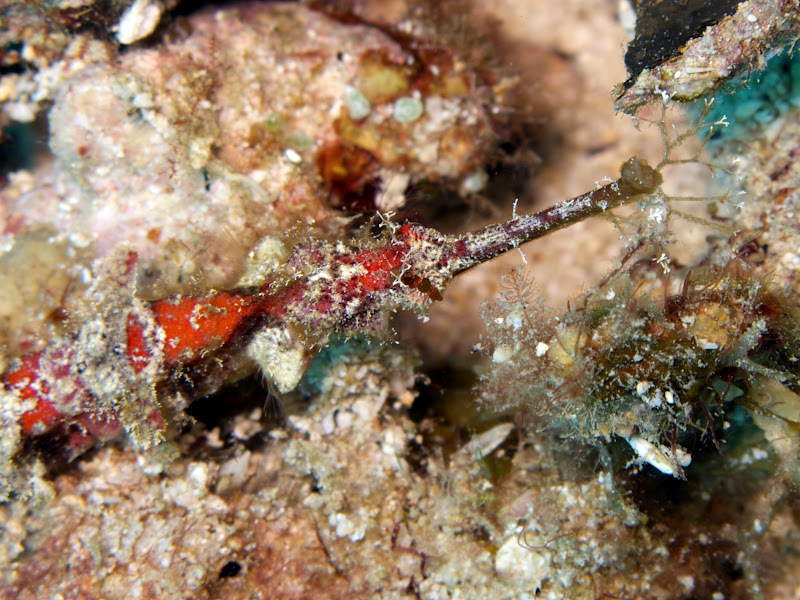 With that he swam closer and pointed to a white tasseled scorpionfish. Wow…I totally didn’t even see it and I was only a few feet away. As we came over the area at Maeda Point that’s covered in gravel, I carefully looked over the rocks. Most people think, “Oh, rocks and dead coral. Nothing interesting there!” If they only knew how wrong they were!!! 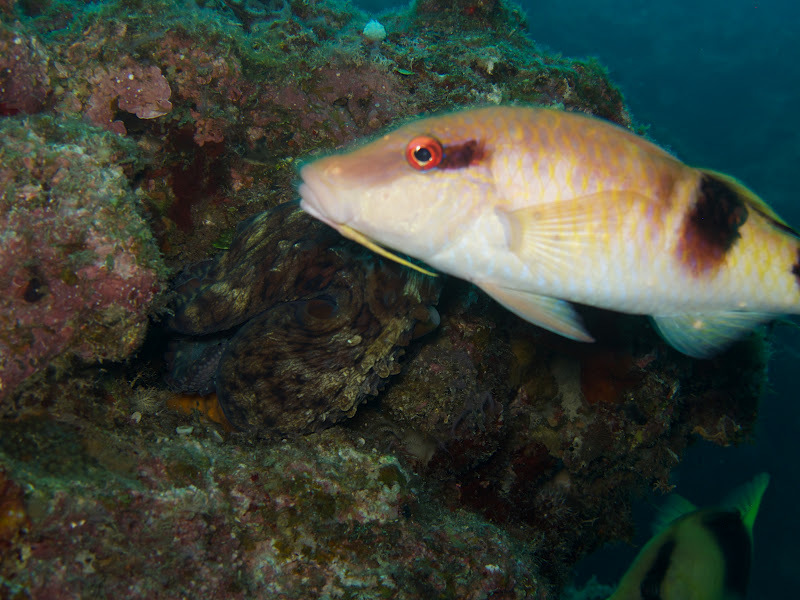 On each dive I do while passing through this area I usually find something of significance – pufferfish, baby cuttlefish, nudibranchs. Today I noticed something that looked like a twig but something was just “off” about it. 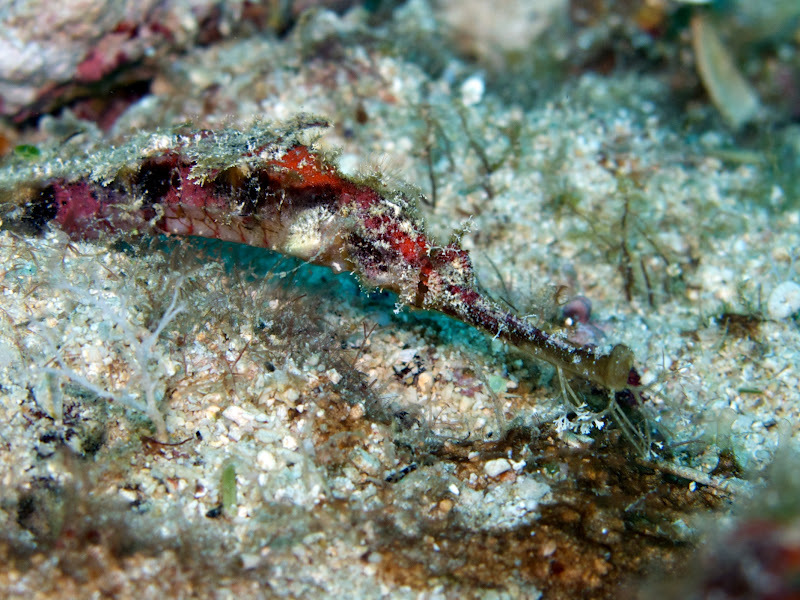 I descended to get a closer view and once I was within 3 feet I realized it was a winged pipefish. I started snapping pictures of it but it was difficult for my camera to focus because it was so narrow in length. Additionally, my camera flash was exceptionally bright and some of my pictures were overexposed. As we came up the chain at the end of our dive, Jason pointed out a Chromodoris magnifica nudibranch resting on some rocks. It was pretty cool seeing it within only 5 feet of water considering that its a rare species for Okinawa. Prior to the dive Randy and I discussed where we were both finding nudibranchs at Maeda Point. 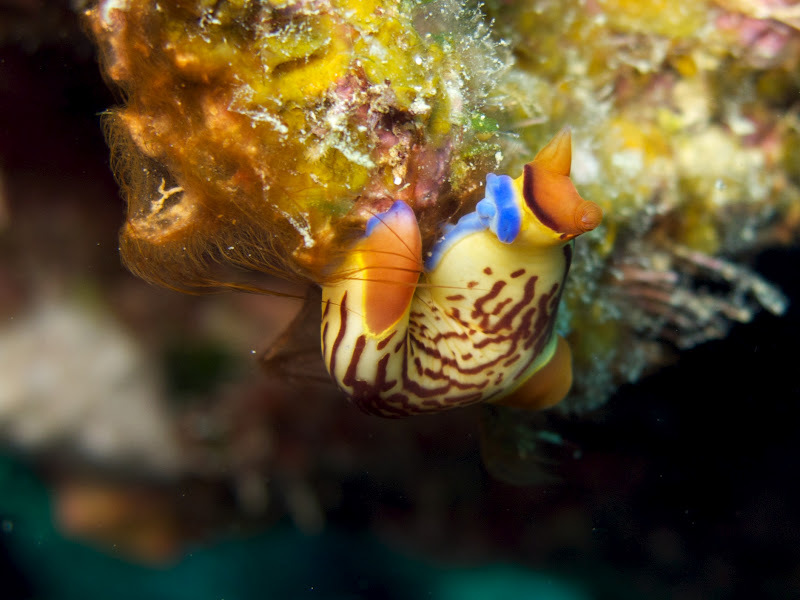 We both agreed that many nudibranchs had seemed to have migrated to cooler waters. 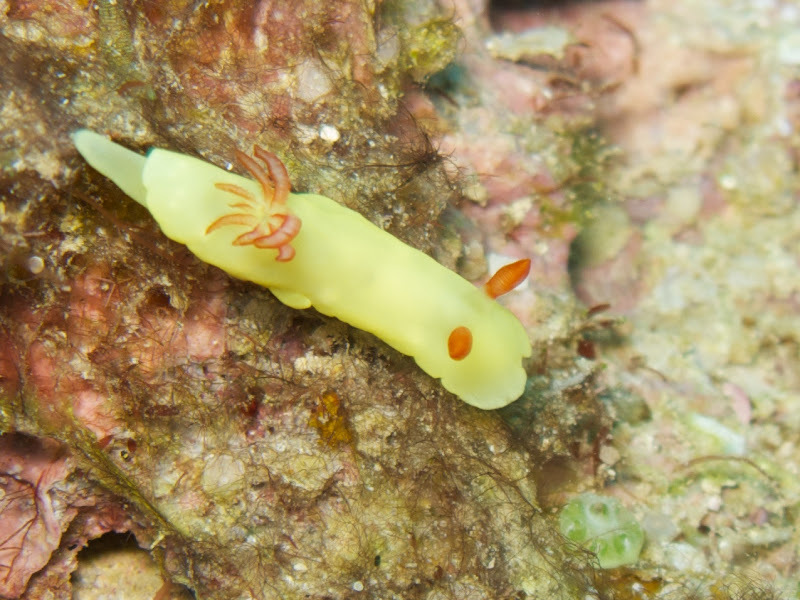 Both Randy and I have recently noticed that there seems to be fewer nudibranchs from 0-30 feet so we figured that going deeper might provide for better results. We also agreed to head to the south where there is a nice reef wall where many nudibranchs have previously been spotted. We started the dive by going down to 90 feet. As we kicked southward we carefully inspected the wall and found lots of nudibranchs including a Reticulidia fungia and a Chromodoris annae. I pointed out the Reticulidia fungia to Randy because it didn’t display any yellow coloring….a mutant! 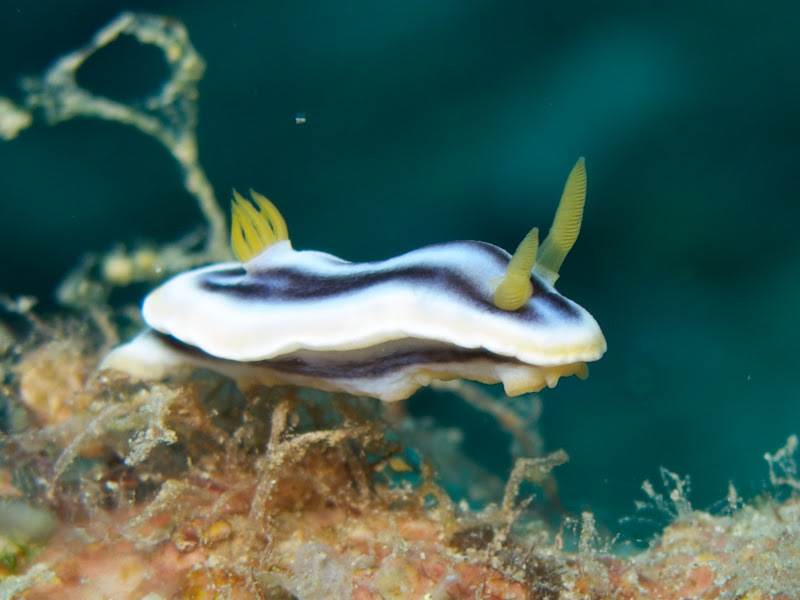 My photo of the Chromodoris annae was a real gem for 2 reasons. First, it is very rare for Okinawa. Second, I was able to see the underside of it, an angle I had never observed before. Unfortunately, my camera started acting a bit funky so only 1 photo turned out. Better 1 than none! 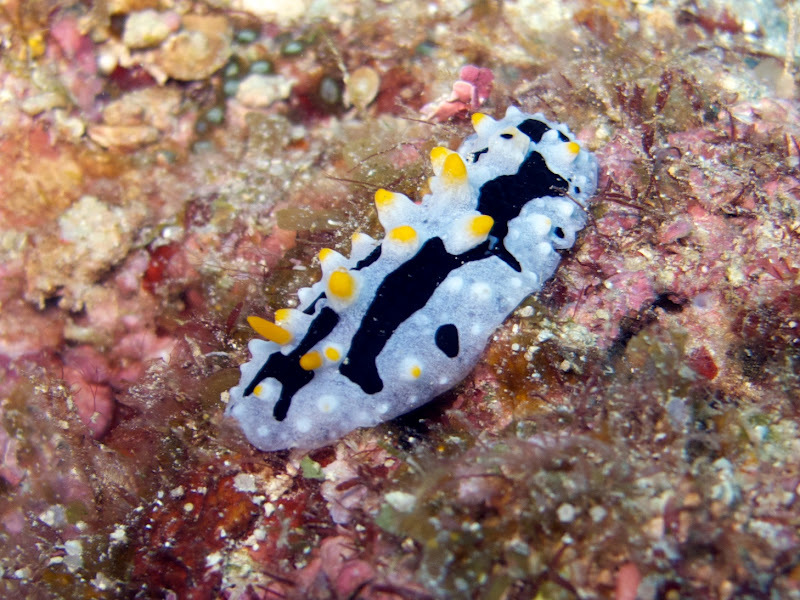 At 90 feet I also spotted a HUGE Phyllidia elegans nudibranch. It was probably about 2.5-3 inches in length. At the end of the dive Randy commented that it was probably the largest he’s ever seen…I would have to say the same thing. 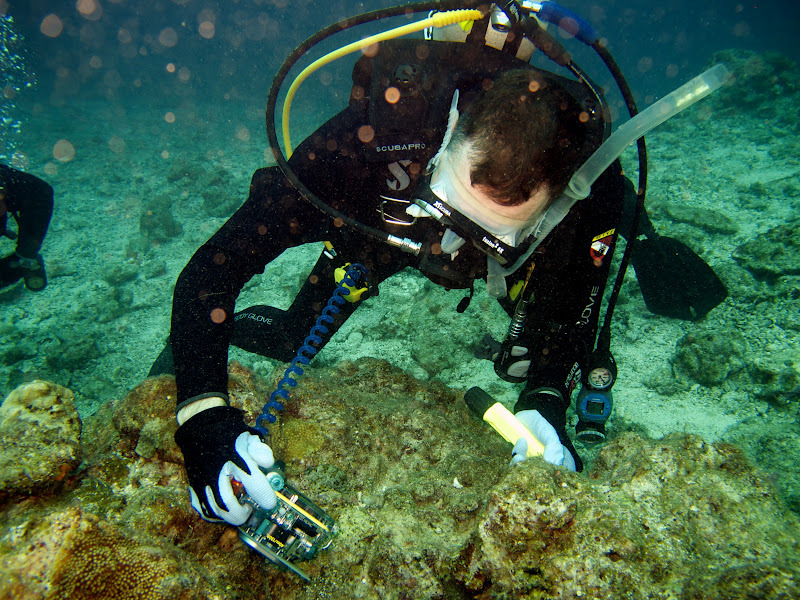 Throughout our dive, we slowly worked our way into shallower depths. At one point Randy motioned me over to a nudibranch he had found. 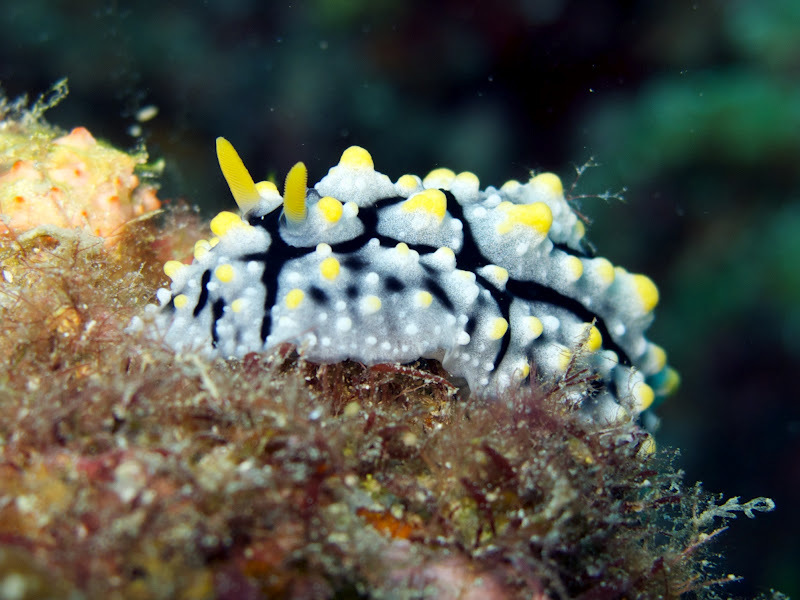 It was blue, black, and yellow – very similar to a Phyllidia varicosa or Phyllidia coelestis. I was wondering what was so special about it but figured if Randy was pointing it out, it must be something good. I snapped a few photos and then continued on the search for new species. 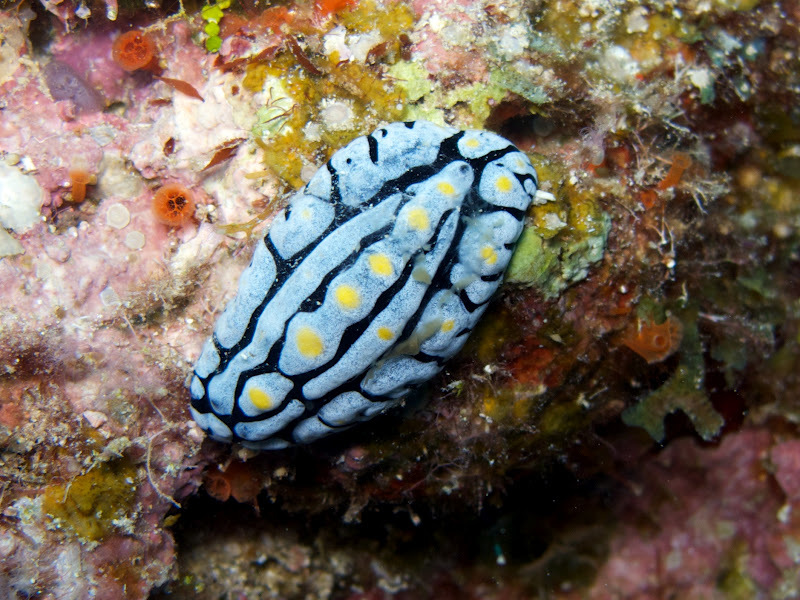 At the end of the dive Randy told me we had seen a Phyllidia willani nudibranch. Awesome! A new species to add to my list! 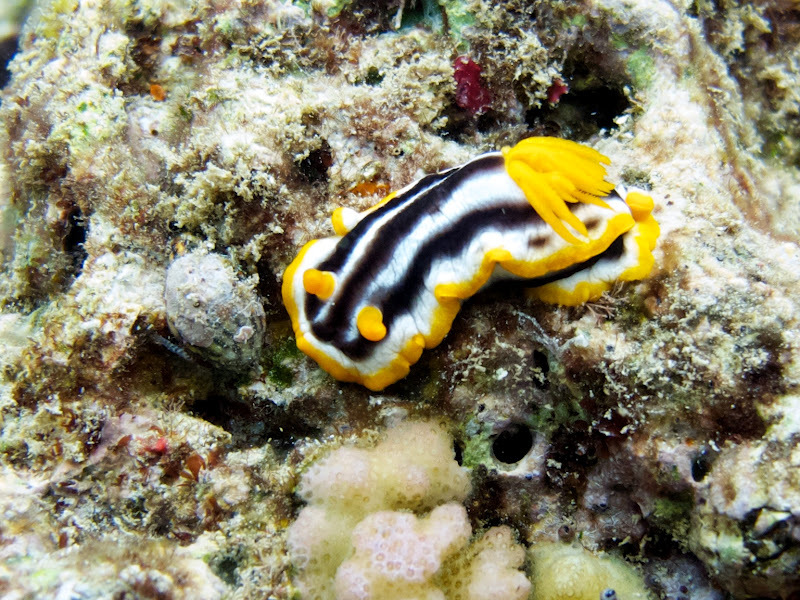 After examining the photos I took it has become very apparent about how the Phyllidia willani differs from other nudibranchs in its physical appearance. There are small, white dots along the body whereas the others noted previously lack this feature. As we continued our swim to the south I came upon a cluster of rocks. 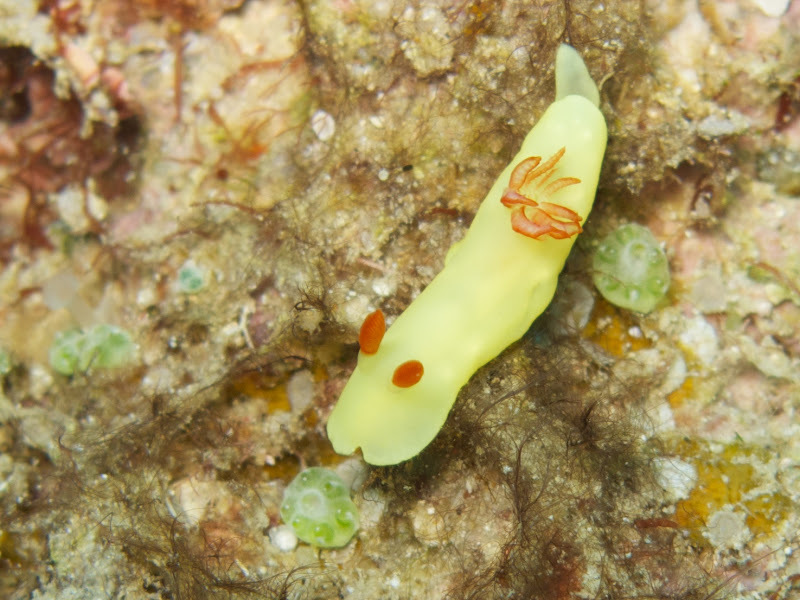 I slowly examined the area and to my surprise I saw a tiny, yellow and orange nudibranch crawling along one of the vertical surfaces. “Hmmm? I’ve never seen this before and maybe Randy hasn’t either,” I thought to myself. I signaled to both Jessie and Randy that I had found something and they both swam over eagerly to see what it was. Randy spent a few moments looking at it and then snapped some pictures. After about 10-15 seconds, he looked up at me and signalled 1-0-0. YAY! I started taking photos of him inspecting the nudibranch and also got a fun one of him smiling at the camera. Very cool! 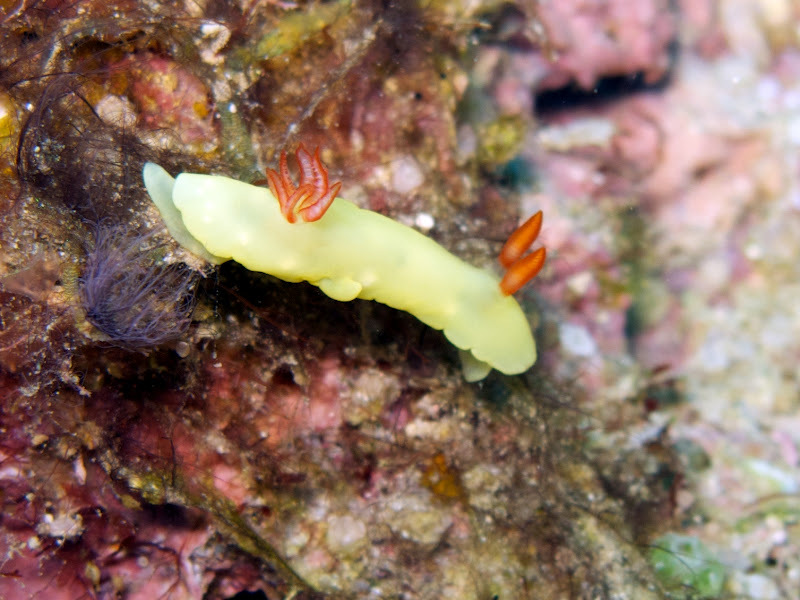 I ended up taking a few photos of the nudibranch too although they didn’t turn out as nicely as I hoped. It was fairly small so it’s no surprise my camera had some issues focusing on it. 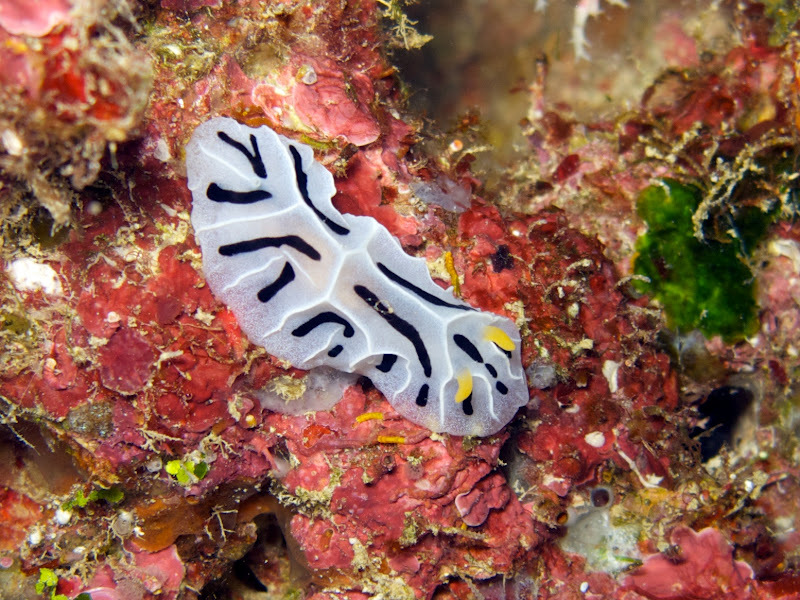 The type of nudibranch we say was a Noumea laboutei, and it is very rare for Okinawa. It was pretty cool that we found this little guy because I probably won’t be seeing another one anytime soon! Soon after spotting the Noumea laboutei we turned around and began heading back to the chain to make our exit. because we we heading back at a shallower depth, we continued to spot various types of nudibranchs and animals while going back. 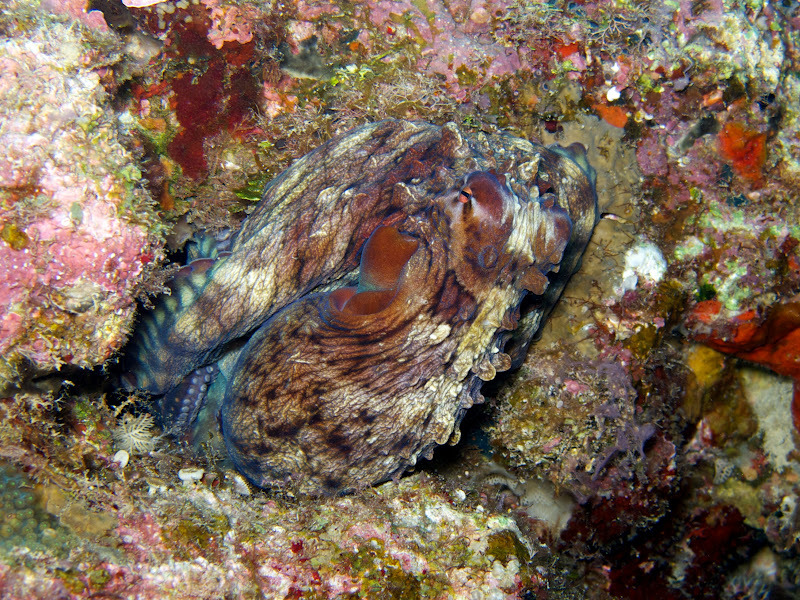 The highlights included a Reticulidia fungia, this time with yellow coloring, and an octopus. A fish decided to photo-bomb my shot of the octopus. Thanks! Seems like the fish at Maeda Point love doing this. It’s the second time it’s happened to me while diving here. The octopus we spotted wasn’t very big but it still allowed me to get pretty close to take some photos. Once the octopus turned a deep red color (a sign that it’s agitated), I moved on to see if there was anything else I could find. 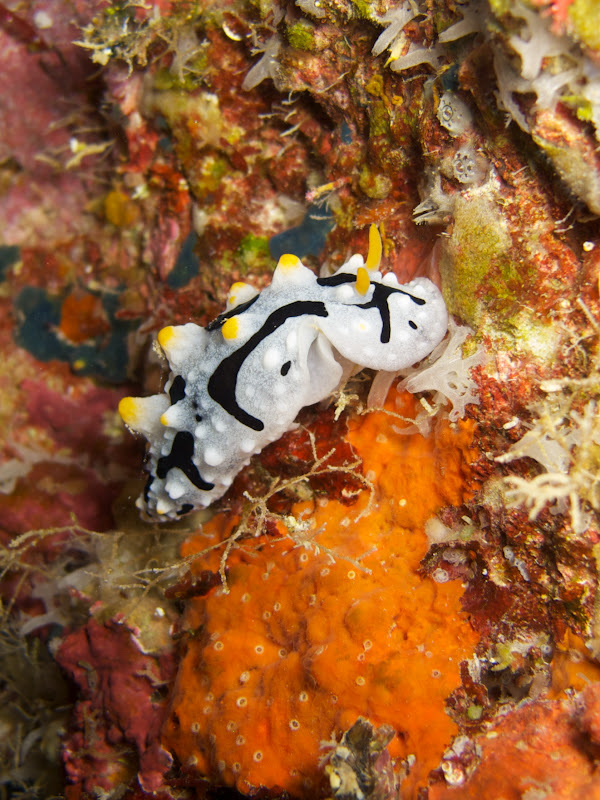 As I returned to the chain I saw a Phyllidia varicosa nudibranch that seemed to be developing its yellow spots. 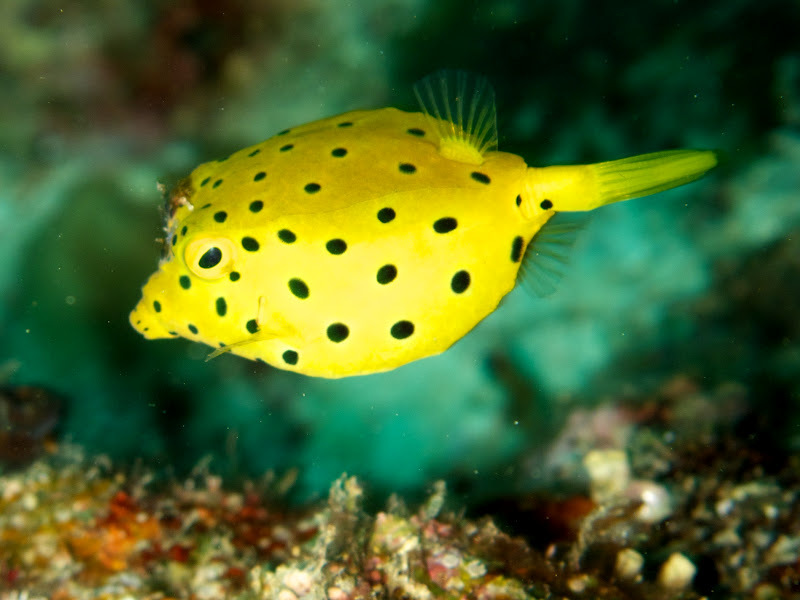 A little further on I also saw a juvenile yellow boxfish hiding among some rocks – a rare sight in Okinawa. Safety stops don’t have to be boring. i usually inspect the rocks nearby and normally I spot some realy interesting creatures. 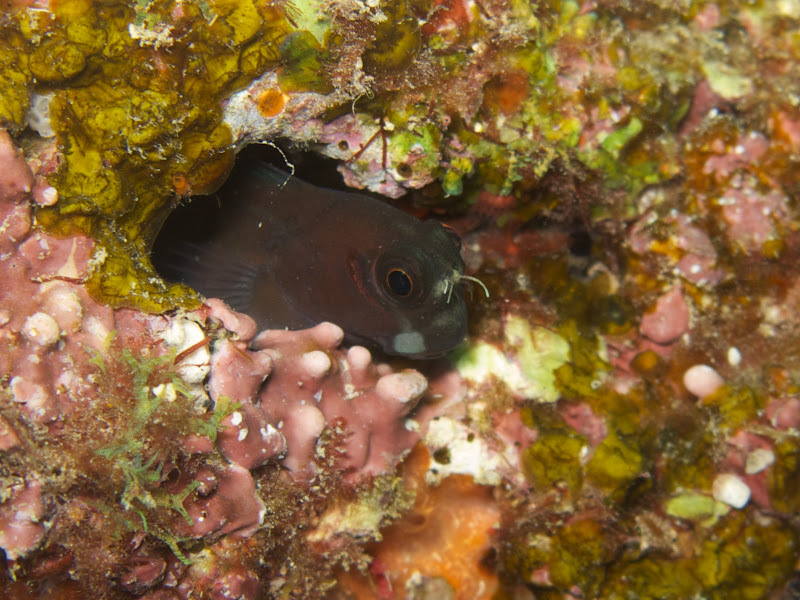 Today I saw a cute blenny sticking its head out from the rocks. 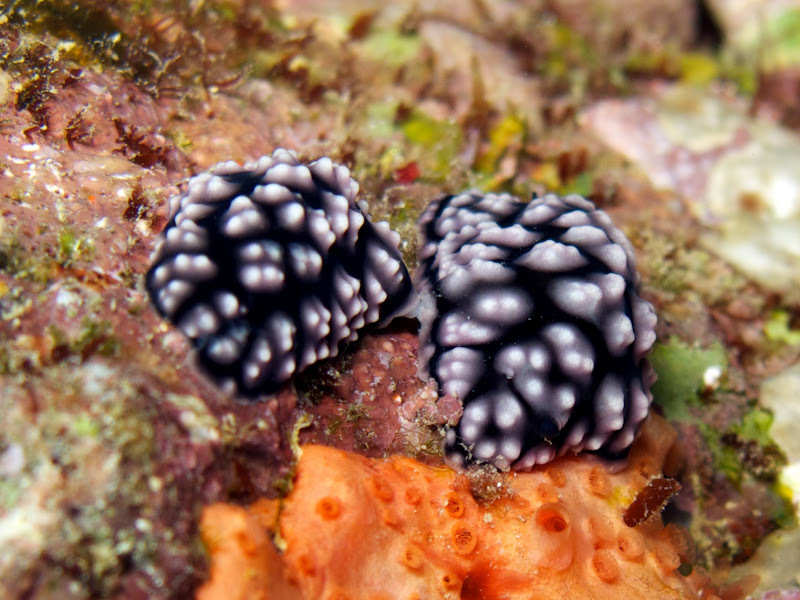 Additionally, i saw two Phyllidiella pustulosa nudibranchs mating. 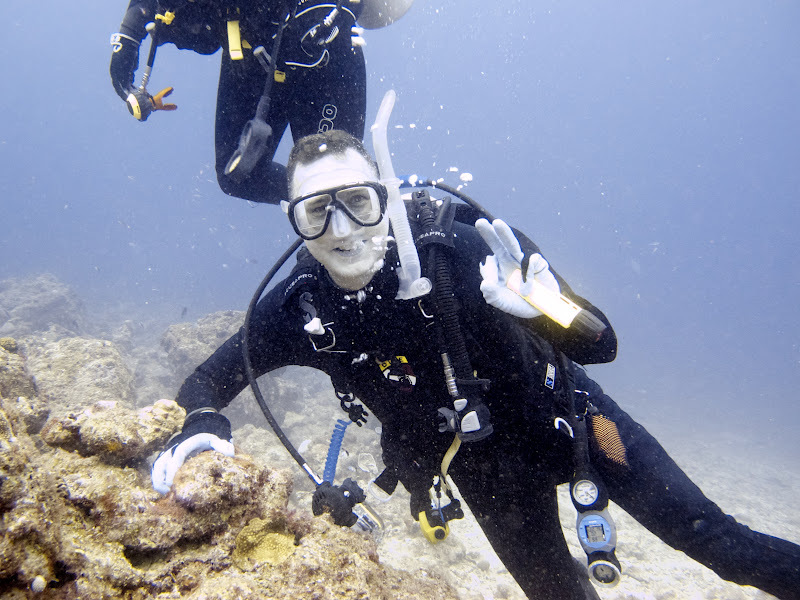 Diving with Jessie, Jason, and Randy proved to be very successful. Jessie was able to squeeze in a few dives before moving off the island, Randy spotted his 100th nudibranch species, and we all had a lot of fun. 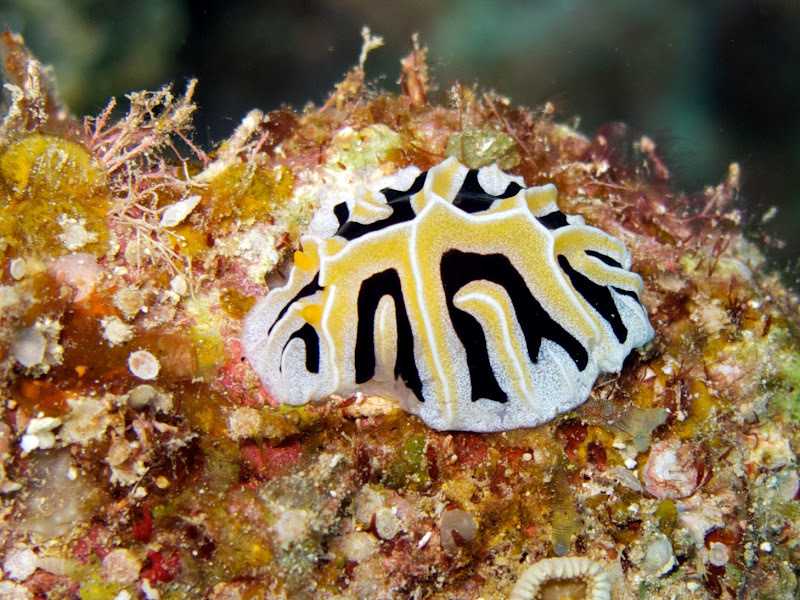 Randy asked me how many different types of nudibranchs I had spotted…unfortunately, I haven’t been as thorough in keeping track of my statistics. I hoping that I’ll eventually be able to sit down and figure out how many I’ve come across…maybe it’ll happen once I move off Okinawa!